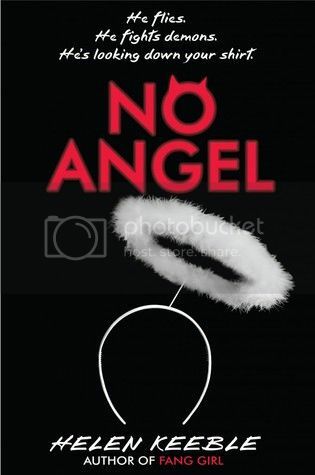 Welcome to the No Angel blog tour hosted by Xpresso Book Tours! Rafael Angelos just got handed the greatest gift any teenage boy could ever dream of. Upon arriving at his new boarding school for senior year, he discovered that he is the ONLY male student. But what should have been a godsend isn’t exactly heaven on Earth. Raffi’s about to learn that St. Mary’s is actually a hub for demons-and that he was summoned to the school by someone expecting him to save the day. Raffi knows he’s no angel-but it’s pretty hard to deny that there’s some higher plan at work when he wakes up one morning to discover a glowing circle around his head. Helen Keeble’s debut novel, Fang Girl, has been praised for its pitch-perfect teen voice, and VOYA called it “refreshing and reminiscent of Louise Rennison’s Confessions of Georgia Nicolson series.” No Angel brings you angels and demons like you’ve never seen them-complete with the wry humor of Vladimir Tod, sinfully irreverent romance, and some hilariously demonic teenage dilemmas. Unfortunately, however, going on a blind date with a demon could be hazardous to your health. A quick Google image search I just did highly detailed and scientific survey has revealed that in today’s popular culture, only about 25% of demons look like the fetching gentleman pictured above. FINAL VERDICT: Unless you want to either get your face eaten, or have a fetish for flaming wheels covered in eyes and/or four-headed winged monsters, stick to dating humans. Loved Fang Girl I cannot wait to read this one!